All five major carriers in the U.S. have updated the Samsung Galaxy Note 8, Galaxy S8, and Galaxy S7 phones to Android 8.0 Oreo and we all know what’s next: the Galaxy J7 2017. Unlike the flagship Note and S families where up to two generations of smartphones are usually beneficiaries of major OS upgrades, this only happens once in the lifetime of a Samsung Galaxy J7 handset and apparently, those using last year’s edition of the Galaxy J7 could be in line to receive Android 8.0 Oreo this coming month of August. 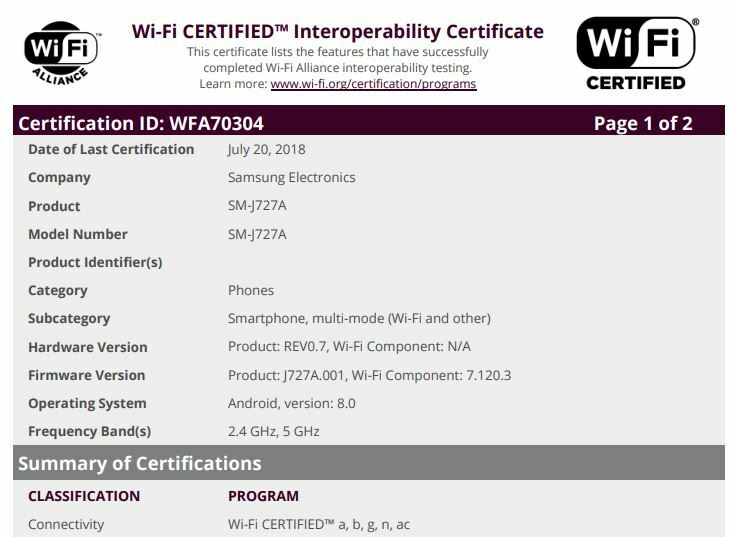 This is not coming from Samsung or any of the telcos that carry the Galaxy J7 2017 in the U.S., rather, we have information from the Wi-Fi Alliance that suggests Oreo’s release date is around the corner. Just as a reminder, the Galaxy J7 2017 has a myriad of names in the U.S. depending on the carrier you buy from. Also, the device has a slightly different model number compared to the global Galaxy J7 2017, but that shouldn’t bother you much. The WFA has cleared U.S. Samsung Galaxy J7 2017 variants with model numbers SM-J727AZ (Galaxy J7 Halo – Cricket), SM-J727T1 (Galaxy J7 Sky Pro – MetroPCS), SM-J727T (Galaxy J7 Sky Pro – T-Mobile), and SM-J727A (Galaxy J7 2017 – AT&T). Also on the list is the unlocked variant that ships with model number SM-J727U. We recently saw the Galaxy J7 Neo/Nxt/Core stop by the same platform, but it had Android 8.1 Oreo running the show. However, from the latest WFA certifications, you can look forward to receiving version 8.0 once the update arrives, perhaps somewhere next month.